I say that JibberJobber is a free job search tool… but every once in a while someone asks to have their account deleted (which you can do on your own) because they find out there is an optional upgrade. 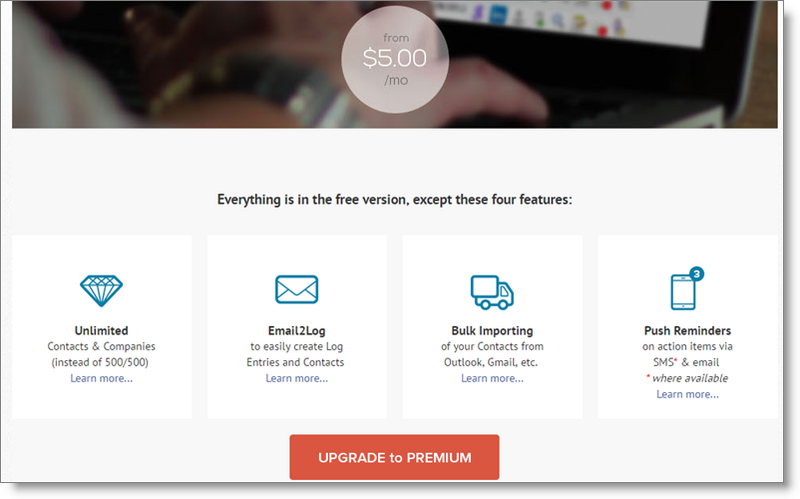 Just like LinkedIn, you can optionally upgrade and unlock some premium features. Hopefully that doesn’t offend too many people. What do you get in the upgrade? The amazingly powerful Email2Log. You can do everything that Email2Log does for you manually, but using Email2Log will save you gobs of time as you strive to organize and track. Unlimited Contacts and Companies. Free/regular users get up to 500 Contacts and 500 Companies… which really, is enough, if you are just tracking contacts and companies directly related to your job search. But some people want to track everything, and import from LinkedIn, Gmail, etc. and after a while, 500 seems to be not enough. Note: if you have more than 500, and then go to the free level, you DO NOT lose those Contact or Company records. Ability to bulk import. Importing from any csv file (like what you get from a LinkedIn export), and merging with Gmail Contacts… this is a great feature because you can quickly and easily get your Contacts uploaded into JibberJobber. Personally, I’m not sure if I would do this for the first few weeks, though… I’m still on the fence on this. That is it – everything else is on the free side! We designed JibberJobber so you can upgrade and downgrade as you need. The monthly cost is $9.95 a month, or you can get one year for $60 (which equates to 1/2 of the monthly cost).